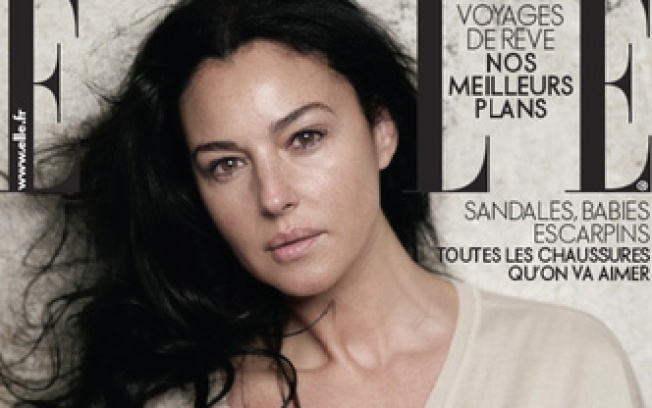 Monica Bellucci: Makeup free on the cover of French Elle. It's peeing-in-pants time over at ladyblog Jezebel, and for good reason: Elle magazine's French edition some of the world's most beautiful women to pose for their cover wearing absolutely no makeup whatsoever. This isn't one of those "Stars -- they're just like us!" attention-grabbers designed to make you feel like less of a loser because (haw!) here's Cameron Diaz at a gas station with bad skin. Just the opposite, actually: Gracing the mag's "Beauty and Truth" issue, the women -- including Italian bombshell Monica Bellucci, supermodel Eva Herzigova, and actress Sophie "Monica Bellucci May Be Stacked, but I'm French" Marceau -- look pretty gorgeous. In a double shocker, not one of these ladies is in her twenties. (Herzigova is the youngest, at 36, and Bellucci tops it out at 44.) Not that Elle makes reference to their ages. That's right: No "Fabulous at 40" or "Look great at any age" coverlines whatsoever -- those wacky French magazine editors put 40-year-old women on the cover and don't mention their age. Imagine! Here in the U.S. we have strict guidelines about these things! We can't help but be excited at the thought of American Elle recreating this little stunt on our shores. But then, can you imagine Jennifer Aniston agreeing to be on a magazine cover without makeup?